Great for kids who use backpacks or briefcases for school. Now they can lock them tight with this kids combo lock. Combination is resettable and lock is made of metal. Comes one side red, one side yellow with blue hasp. Lightwieght but strong. Also comes with offer for three free issues of kids sports magazine and activity booklet. 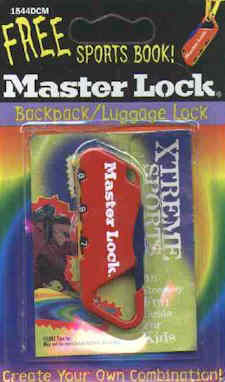 Made by the Master Lock company.